By John F. McKenna (McJack): Trainer Robert Garcia had no illusions when his fighter former WBA/WBO/IBF welterweight champion Antonio Margarito (38-8, 27 KO’s) took on WBA super light middleweight champion Miguel Cotto (37-2, 30 KO’s) last Saturday night. Garcia knew that Cotto would make adjustments after his humiliating loss to Antonio in July 2008. He also had to know that Margarito is a one dimensional fighter who bores in and applies pressure. Nothing pretty, Antonio uses his aggression and tough chin in hopes of exacting his pound of flesh from whoever he fights. His style never changes, it is what it is. Cotto fought his well rehearsed game plan to perfection and began keying in on Margarito’s damaged eye early in the contest. Antonio was never able to get on track. Thinks just did not go his way in his 2nd encounter with Cotto. The fact that the fight took place in New York City’s famed Madison Square Garden (MSG) gave a huge psychological boost to Cotto. Thousands of adoring Puerto Rican fans poured into MSG to cheer on their favorite fighter, and Cotto did not disappoint. Cotto landed numerous clean, crisp shots to Margarito’s previous damaged eye which caused severe swelling. Miguel was able to avoid Antonios most dangerous weapon, his wide right hand, by stepping to the side. 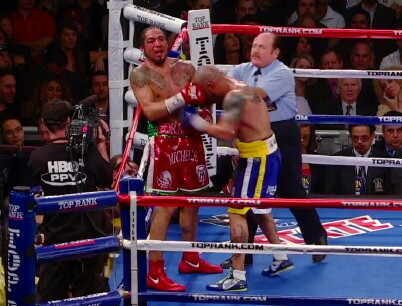 Cotto weaved in and out, safely landing punches and then moving back out of harms way. Margarito had no antidote for Cotto’s new game plan as he was left to fall far behind on the score cards. At times Garcia felt that Margarito was beginning to show flashes of what he had exhibited in his first fight with Cotto, but is was too little and too late. Garcia felt that at the time of the stoppage Antonio was ready to make his move. The referee and ring physician however were not prepared to let a fighter coming off of recent eye surgery risk further injury. As for Margarito’s future Robert Garcia is prepared to support whatever decision he makes regarding his boxing career. He feels that Antonio has enough left to give trouble to many fighters. Margarito did not have to go to the hospital after the Cotto fight and Garcia sees that as a positive sign. « Can Miguel Cotto do the impossible? Boxing » Antonio Margarito » What’s next for Margarito?